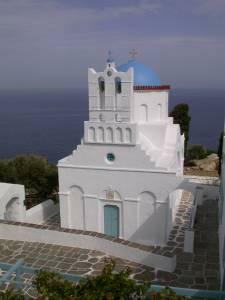 The island of Sifnos is a unique destination in the Aegean Sea. It is one of the six islands of the Western Cyclades, and it is situated between the islands of Serifos and Milos. The island has become known for its authentic and changeless traditional whitewashed settlements, enchantingly harmonized with the natural surroundings, for its remarkable cleanliness, for its countless churches and monasteries, for its superb beaches, and for its living cultural heritage. It is situated among the islands Serifos, Kimolos and Milos, and in the administrative field, it belongs to the District of Milos. Its surface is 75 square kilometers. Its 2,100 permanent inhabitants are occupied with tourism, agriculture, animal breeding, fishing, and shipping. Pottery is an important occupation of the people of Sifnos, an activity long associated with the traditions and the history of the island. Apollonia, Sifnos' beautiful Chora, stretches out radiantly on the hillside, uniting the nearby villages in such a way that it is difficult to discern where one village begins and another ends. Get to know and discover Sifnos on foot, far from the asphalt-paved roads. By following the path from Chora, you will reach Artemona, a village with architectural tradition, old churches, and monasteries that are worth seeing. The Alexandros consists of approximately 50 guest rooms spread over 6 buildings of different levels, very much as you would expect to find in a small village. This small complex of simple rooms offers a truly panoramic view over the port of Kamares, and puts you within walking distance of shops, restaurants and sights of the main port of Sifnos.